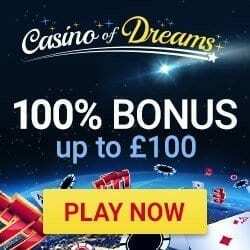 Casino of Dreams Review - 100% cash match on 1st deposit! Launched in 2015 with an impressive and responsive theme, Casino of Dreams combines all the elements required by the modern gamer. The starry night imagery creates a fantasy online world, but it’s the games which will really draw you in; as Phone Bill Casino can testify. Whether you prefer progressive jackpots, table casino, tournaments or the hottest slots around such as Immortal Romance and Bikini Party; Casino of Dreams has them all. So make sure you take a peek through the entire range, rather than opting for your usual go to favourite; who knows what new treasures you can discover. 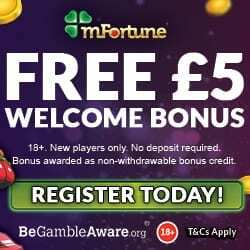 Your bonuses begin when you make a 1st deposit, because you’ll receive a 100% cash match bonus on amounts between £10 and £100. So should you add the minimum £10, you’ll end up with a grand total of £20 to play with. 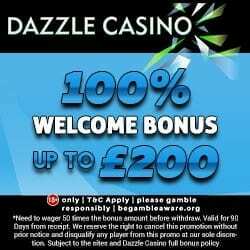 Casino of Dreams have yet to unveil any regular promotions on the site, but should this change please be assured we’ll be the first to let you know. For most of us it’s essential that a site offers some form of social media page, to make it easier for us to keep up on the latest game and offer news. Thankfully Casino of Dreams have both Facebook and Twitter pages, so make sure you check them out. 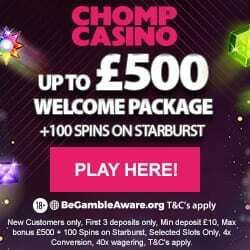 Joining Casino of Dreams doesn’t just bring you bonuses, you’ll also become a member of their loyalty scheme. You earn points as you wager and these points can be redeemed as additional gaming credit (100 points equating to £1). You’ll not only get loyalty points but also a birthday bonus, spins Friday and bonus Monday. To contact a representative from Casino of Dreams, you can either use live chat on the site or email. They are available on a 24/7 basis and will aim to respond within a reasonable time scale; depending on the complexity of the issue. Casino of Dreams accept the usual banking methods, including Credit and Debit Cards, Paysafe Card, Skrill and Neteller. Did you know that Neteller now accepts pay by mobile via Boku, which means that for a small transaction fee you can use mobile billing. If you want to know more about charging credit to your mobile bill, then check out our article on Neteller accepting Boku payments, where we provide further clarification and a list of additional sites. To head to the enticing site that is Casino of Dreams, simply use one of our links and enjoy!